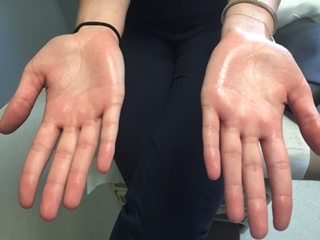 Palmar Hyperhidrosis, or sweaty palms, is the most common symptom of Hyperhidrosis and can be the most socially and emotionally disturbing symptom. The occurrence of excessive sweating of the palms, a symptom of palmar hyperhidrosis, is not linked to typical sweat-inducing conditions, such as warm weather or physical activity. Palmar hyperhidrosis impacts between 1-3% of the population, typically presented during childhood or adolescence. Palm sweating can be accompanied by hyperactive feet sweating and armpit sweating, but palmar sweating is the most difficult to control and is the most troubling. For most individuals suffering from palmar hyperhidrosis, quality of life can be severely impacted. Sufferers may avoid social situations entirely for fear of others noticing their condition. They avoid social interactions such as handshakes or other forms of contact. Further, a fear of physical contact can negatively impact relationships. Those living with palmar hyperhidrosis may experience a great deal of stress and anxiety from their excessive sweating that can ultimately impact their ability to perform daily tasks required of them at work or school. Palmar Hyperhidrosis is caused by hyperactive sweat glands in the hands. Instances such as holding hands or shaking one’s hand may excessively stimulate the sweat glands in the hand leading to unusually sweaty hands. While excessive sweating from palmar hyperhidrosis may happen for no apparent reason, sweating can be made worse by situations that induce stress, anxiety, nervousness or fear. There also appears to be a strong genetic component with the occurrence of palmar hyperhidrosis, with an estimated 30% of sufferers having a family member that experiences excessive sweating. Your doctor may recommend a series of tests to pinpoint the hands as a location of excessive sweating and determine the severity of the disorder. Iontopheresis – Treatment specifically for sweaty hands that utilizes a mild electric current through water to reduce hyperactive sweat glands. ETS – A minimally invasive surgery that is the best treatment for patients with severe Palmar Hyperhidrosis. You no longer have to battle palmar hyperhidrosis alone. Contact the Center for Hyperhidrosis today to discuss hyperhidrosis treatment for hands that is right for your specific situation. We will address any concerns you may have, including forms of treatment, insurance coverage, palmar hyperhidrosis surgery cost, and more.